Always wanted to explore Southeast Asia but don’t know where to start? With its lush landscapes, urban jungles, intricate architecture, ancient temples and innovative cuisine, Southeast Asia has so much to offer! Don’t hesitate any longer and start uncovering the hidden gems within this paradisaical region right now! In this 2-week itinerary, we bring the best of Southeast Asia. Grab your passports and pack your bags because you’re in for an amazing vacation! Plus, with great deals from HSBC, you’re definitely in good hands to explore the marvels of Southeast Asia while keeping your wallet intact at the same time! From flight deals to tour packages, discounts on wifi rental, hotel bookings, and even travel insurance, planning your vacation will be a breeze with your HSBC Credit Card! What’s more, get a gift of your choice when you charge your travel bookings to your HSBC Credit Card from now till 31 October 2017. Choose from a Sony Camera a5000 (worth S$799), a Pierre Cardin luggage or up to S$500 RWS Gift Vouchers. Register via SMS now. Get started on your Southeast Asian adventure today! Dubbed the “Paris of the Orient”, Hanoi continues to hold the key to Northern Vietnam’s history, from colonial architecture to vibrant street life. Sign yourselves up for one of the free walking tours and you’re well on your way to explore the streets and discover the charm of Hanoi! First up! 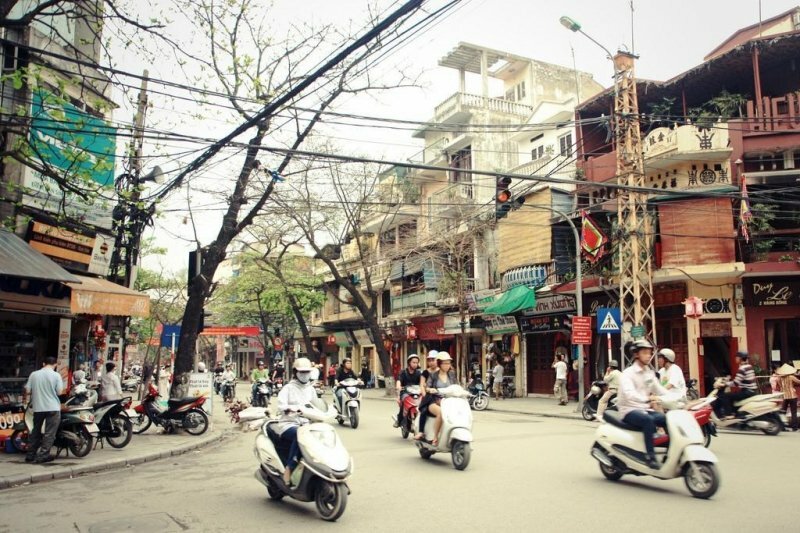 Visit Hanoi’s Old Quarter. While you’re there, travel back in time as you stroll along the narrow streets lined with antique yet unique brick houses – an eclectic amalgamation of the old and the new. 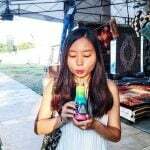 Shop at the local night markets, treat yourself to a refreshing cup of Ca Phe Sua Da (iced coffee with milk) at the numerous cafes, and most of all, feast on a sumptuous meal of Cha Ca La Vong (grilled fish with turmeric and dill)! 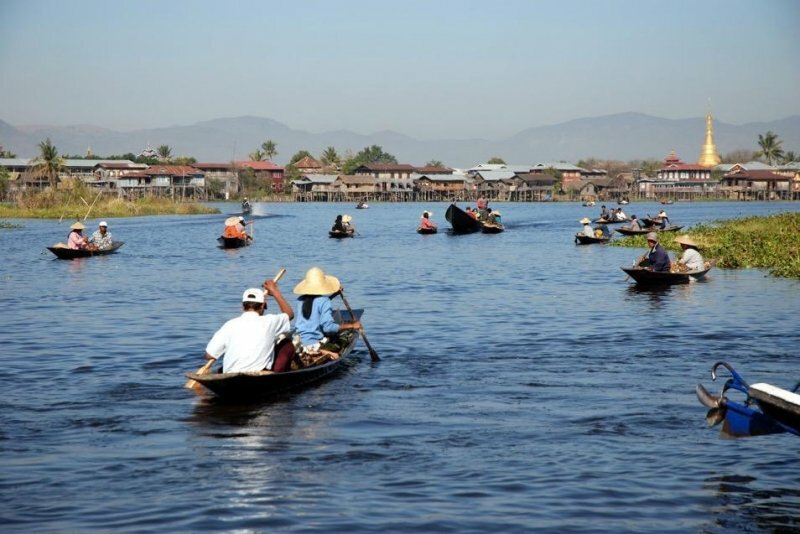 Offering a glimpse into the local Vietnamese culture, this is an area not to be missed! Also, swing by Hanoi Train Street located between Lê Duẩn and Khâm Thin street in Hanoi’s Old Quarter, to witness the trains speed across the tracks, right between the narrow residential walls of the street. After exploring the streets, chill along the sidewalk, sink into the hustle and bustle of this vibrant city and enjoy some Beer Hoi (homemade beer) on Ta Hien Street. Alternatively, sign yourselves up for a Cyclo Tour or a Vespa Tour! There’s no better way to get around Hanoi than with a Cyclo or Vespa Tour. Practical and effective, you’ll be able to zoom through traffic in no time! The guides will also bring you to local haunts with delicious, authentic Vietnamese food that remain elusive to tourists. On the second day of your trip, grab your bags and we’re off to Sapa! From Hanoi, choose to travel by train or bus to Sapa. 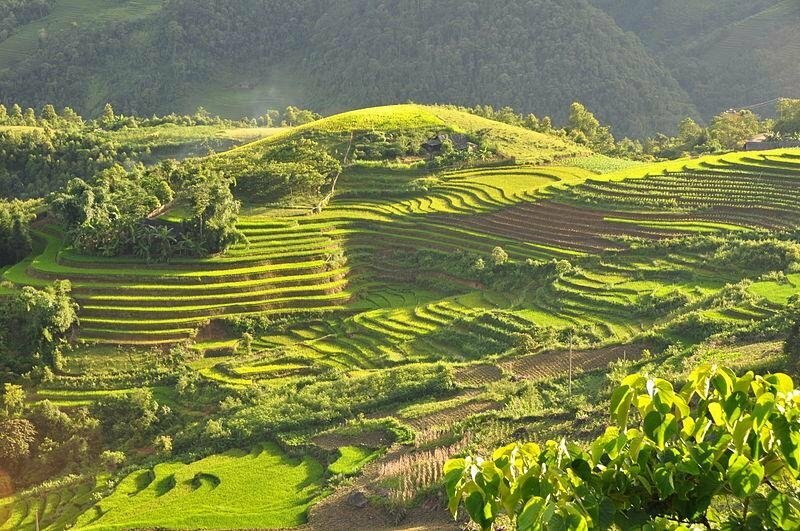 We recommend that you spend the night in Sapa so as to have ample time to take in its charm and beauty. A breathtaking mountain town, Sapa is known for its spectacular landscapes – comprising of picturesque mountains and rice terraces. 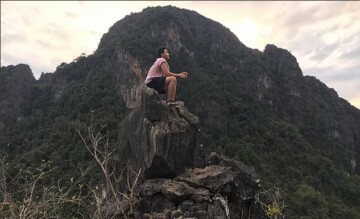 If you’re into hiking, you could choose to hike the countryside around Sapa on your own, or join a tour with a private guide to bring you around. Known for the ethnic minorities that reside in the area, pay a visit to the villages to catch a glimpse of their lives! Look out for the local farm animals like buffaloes and ducks, and also the plantations of rice, corn or cabbage. Rather than spending the night in a hotel, go for a homestay experience instead! You’ll be able to explore the village and get the opportunity to have a taste of home-cooked meals and rice wine specially prepared for you by the locals, yum! The last stop for our Vietnam leg, Halong Bay! Don’t underestimate this beautiful wonder of the world. You’ve really got to see it to believe it! The best way to explore Halong Bay? Definitely a 2D1N cruise on a junk boat hands down. See Halong Bay in its full glory from the sea and also sail to remote areas that would be inaccessible on your own. If you think it’s all sightseeing and no action on the cruise, think again! You’ll have access to a multitude of activities from visiting a floating village, attending a cooking class to squid fishing and cave exploration! 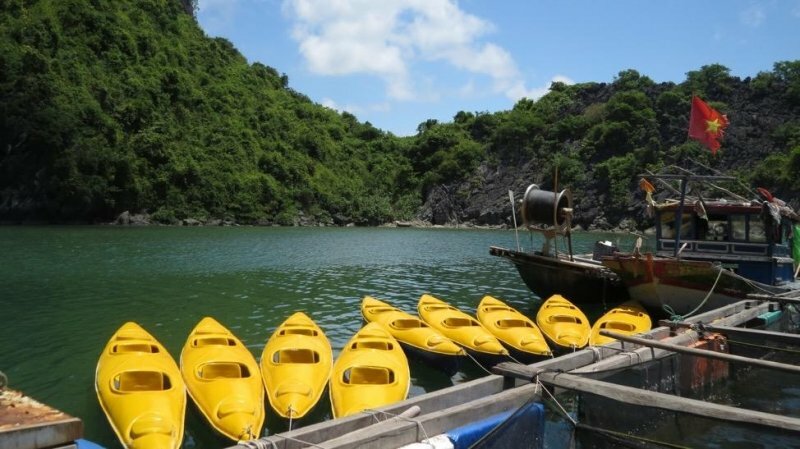 Take a trip to Cat Ba Island, the largest island in Halong Bay. Explore the island’s National Park, home to the endangered Cat Ba Langur. 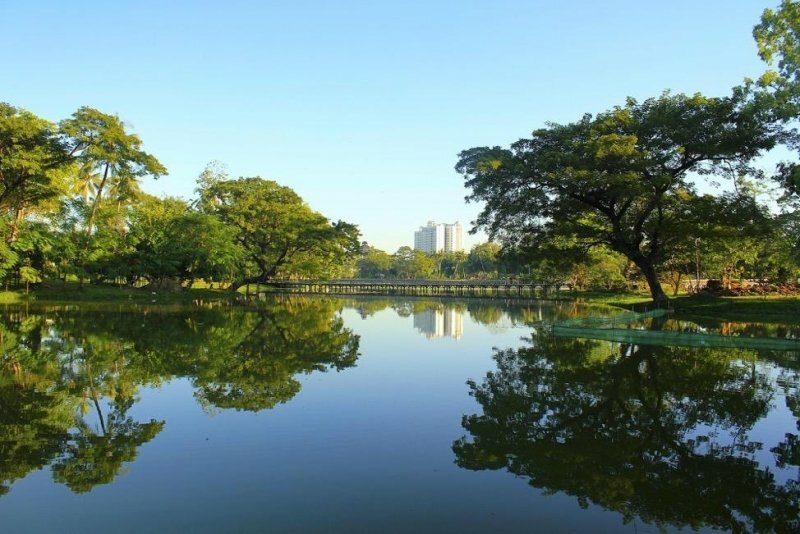 Get up close and personal with nature while you take a leisure walk within the vicinities of the park! Get on a kayak to enjoy the stunning karst archipelago! Kayak your way to hidden lagoons, caves, through archways and floating villages. Soak up the sun, take in the stunning views, swim in the cool waters – and that’s how you enjoy the best of Halong Bay! 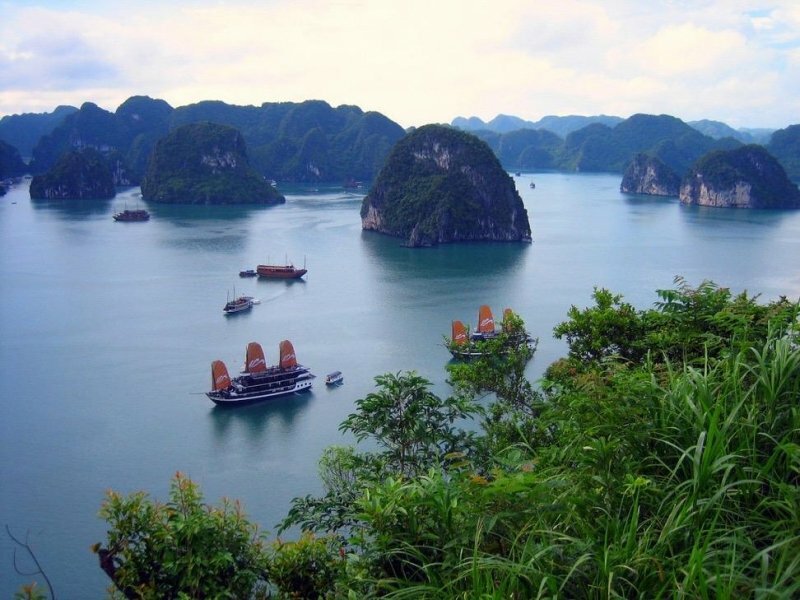 Can’t wait to explore Halong Bay on a cruise but don’t know where to begin? No worries because we’ve got you covered! With your HSBC Credit Card, you’ll be able to book yourself a cruise via Klook! Plus, you get to enjoy an additional S$5 OFF Klook’s Southeast Asia attractions & tours with a minimum spend of S$80, so there’s no reason to resist! Sawadee Kap! For this leg of our Southeast Asia adventure, we will be spending 3 days in Northern Thailand. Did you know, Northern Thailand is surrounded by the tallest mountains in Thailand and it is cooler than the rest of the hot and humid regions in the country? It’s the ideal getaway to escape the summer heat! A departure from the hustle and bustle of city life, rest and recharge with delicious delicacies and leisure wandering in Chiang Mai. 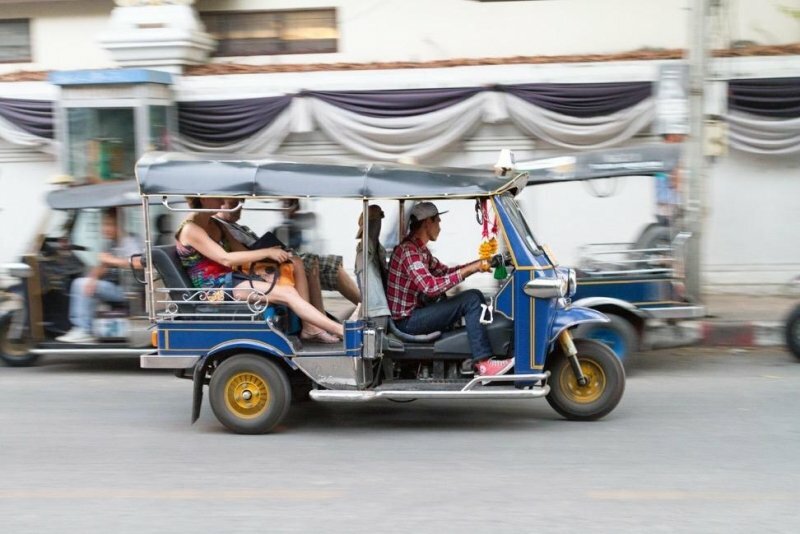 As you arrive, find yourselves greeted by Songthaews and Tuk Tuks that line the streets! Hop onboard for some great fun and to get from point-to-point conveniently and hassle-free. 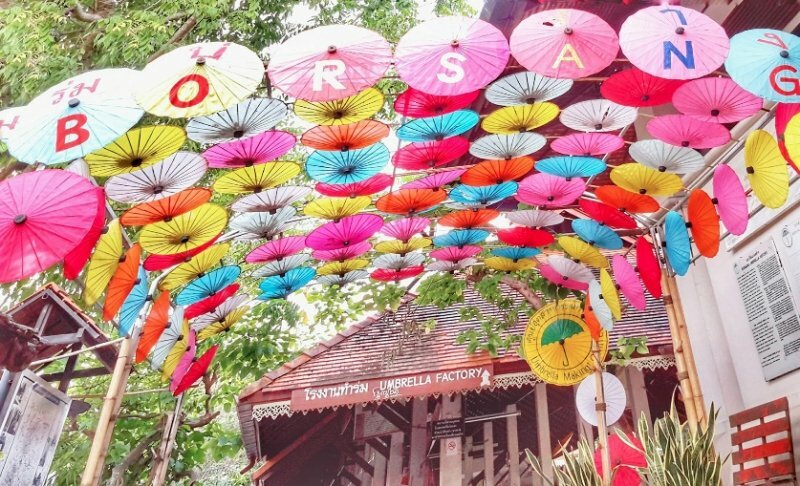 Have you heard of the world-famous Sa Paper Umbrellas and Parasols? 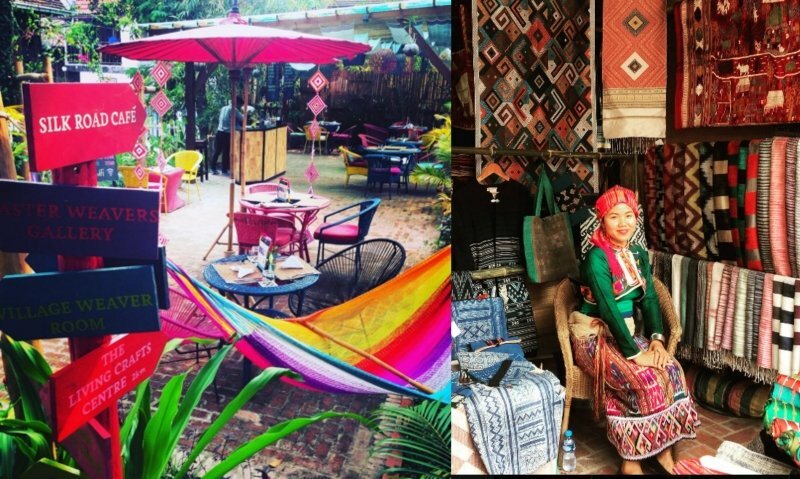 Venture down southeast of Chiang Mai and you’ll find yourself at Bo Sang Handicraft Centre, home to these beautiful crafts! Feel free to take a stroll within the premises and learn about the process of Sa paper umbrella making. Watch the artisans make the Sa paper from scratch and hand paint every single piece. From carving the wooden shaft and handle by hand, to putting together individual umbrella bamboo spines and stringing them together, this is no doubt a fascinating and eye-opening experience! 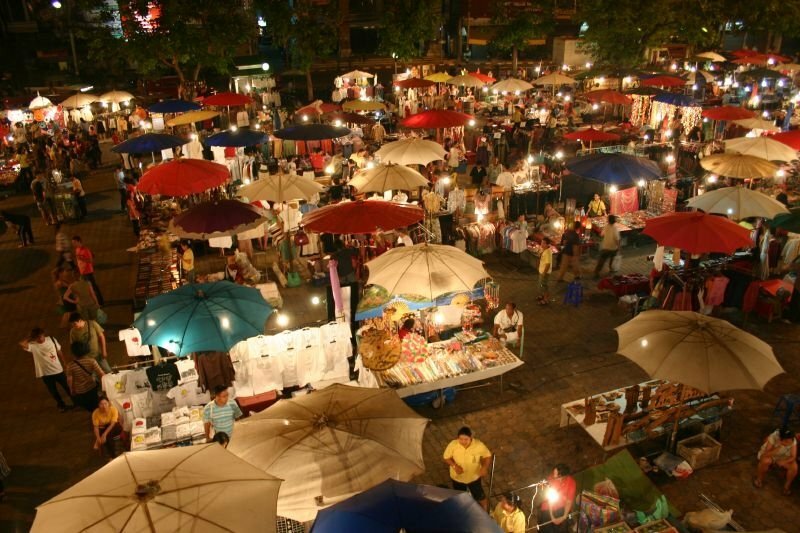 The Sunday Night Market is a large market situated right in the middle of the old walled city area of Chiang Mai. As its name suggests, the market operates on Sundays from 4pm to midnight. Find yourself browsing through a large showcase of art and craftsmanship by the locals. Perfect as gifts and souvenirs to bring home, find yourself something unique as a keepsake of your Chiang Mai adventures! Guess what? We’ve got something that will make your wallet even happier. Book your accommodation with your HSBC Credit Card on Expedia, and enjoy up to 50% OFF hotel bookings plus an ADDITIONAL 10% OFF! Isn’t that absolutely awesome? Take your pick from the wide selection of hotels available in Chiang Mai and start booking your favourite one! 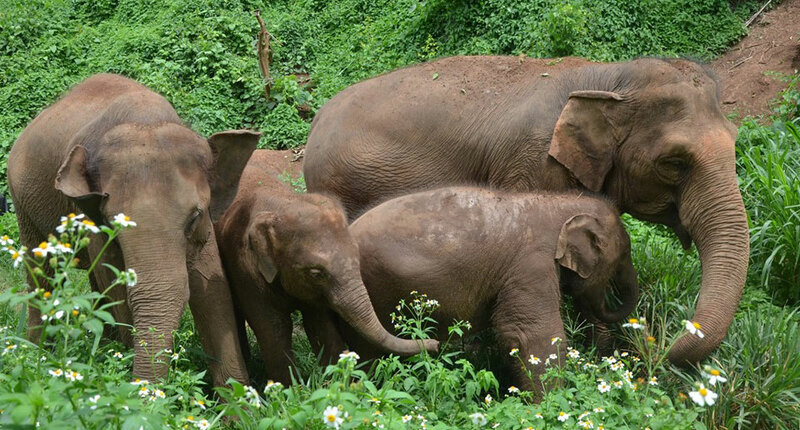 On your second day at Chiang Mai, travel out of the city and embark on a day trip to the Elephant Nature Park – a rescue and rehabilitation centre for the elephants that had been mistreated, abused and overworked. It also simultaneously educates its visitors about responsible tourism. With its vast green landscape of 250 acres, elephants get to roam freely around the parks and river, treating themselves to a mud bath. During your visit, feel free to join a tour of your choice where you’d be able to get up close and personal with these gentle giants from bathing and feeding them to going for jungle walks! For your last day in Thailand, we’re off to Chiang Rai! 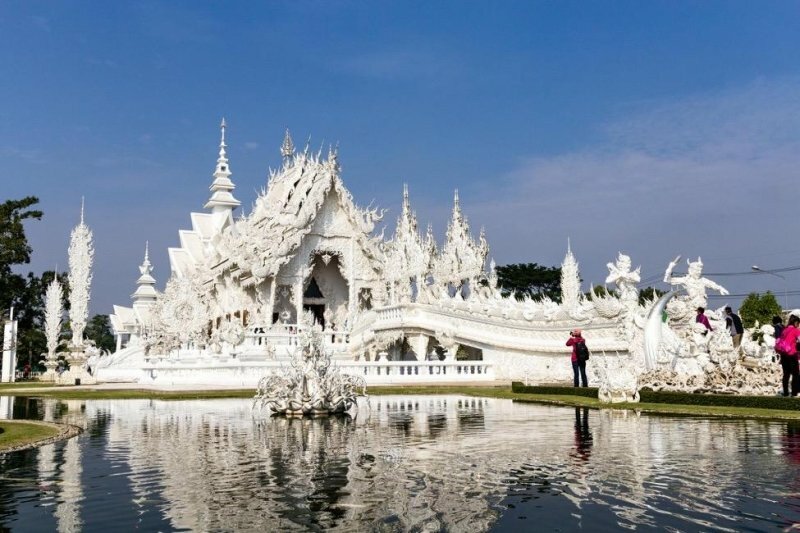 Just outside the town of Chiang Rai lies Wat Rong Khun, better known as “the White Temple”, and is probably one of the most recognisable temples in Thailand. With its striking white colour and pieces of glass on the temple’s exterior, watch the temple glisten beautifully in the blazing sun. A modern Buddhist design paired with an intricately carved facade, the temple is simply an architectural marvel! P.S. If you find yourself needing the bathroom, check out the golden toilet that’s located within the premises of the temple ground! 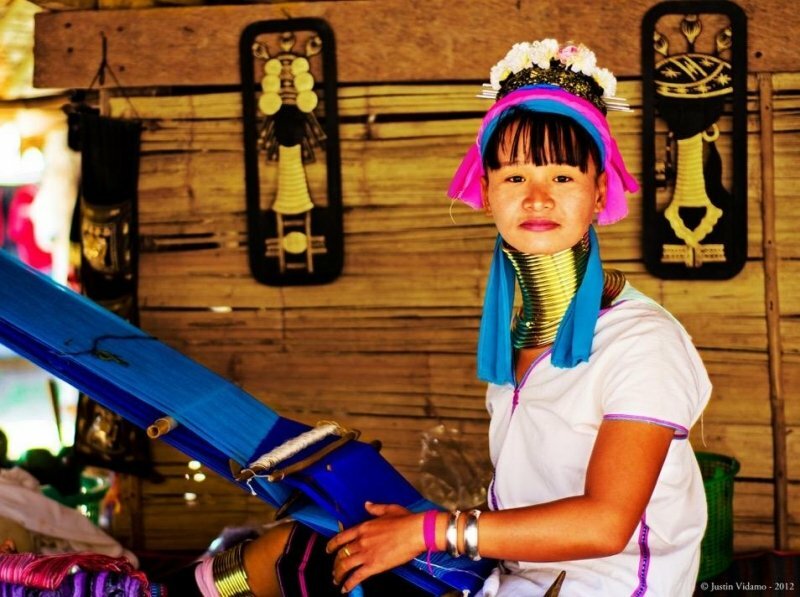 En route to the Golden Triangle located further up north, take a pit stop at the Karen Long Neck Village. Karen women wear their iconic heavy brass rings around their necks, forearms and shins. You may not know this but it is said that the practice of wearing the brass rings was to protect themselves against tigers when being attacked. As time goes by, you may notice that some of the Karen women are forgoing this tradition and it probably won’t be long before the women stop wearing these brass rings like they used to. 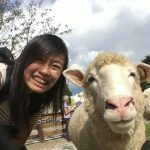 Want to Instagram your travel photos with the Karen Tribe? Or stay updated on the latest happenings? Wireless connectivity can be sketchy in Thailand but it doesn’t have to be! Stay connected all the time when you rent a portable wifi from Changi Recommends with your HSBC Credit Card today! P.S. You’ll get an exclusive 7% discount off rental rates, and that’s no small amount by far! Every dollar saved enables you to travel even further and better! 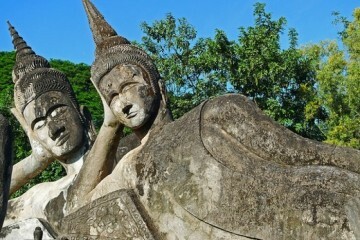 For your final stop in Thailand, we’ll be visiting the Golden Triangle, the meeting point of Laos, Myanmar and Thailand. 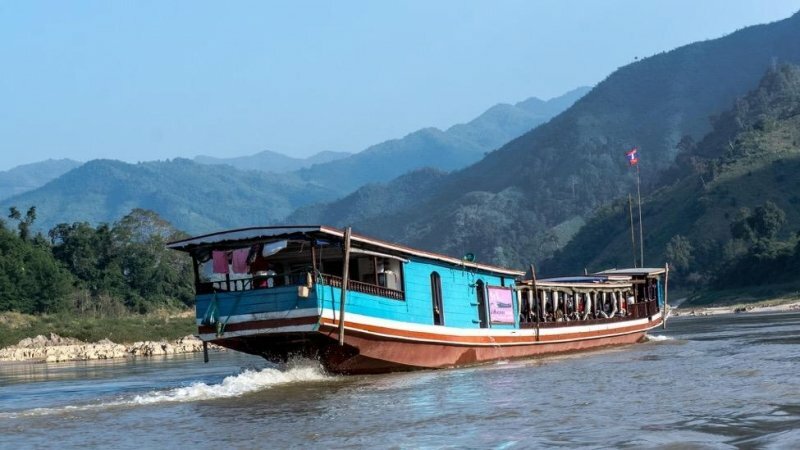 While you’re there, hop onboard a slow boat and cruise down the Mekong River. Remember to keep a lookout for the iconic Buddha statue right next to the river! As you travel across the river, choose to disembark at a small island named Don Sao, belonging to Laos. Here, you can take a tiny glimpse into the Lao culture as you walk off the dock right into a market. If you’re in the mood to do some exploring, push yourself to the outskirts to witness some everyday life away from the touristy market. From children playing in the sand to mothers doing laundry and men fishing on the riverbanks, this gives you a sneak peek to the daily lives of the Lao people. Intrigued? No worries because there’s much more to be discovered as you prepare for the next leg of your travels. Off to Laos we go! After an intriguing glimpse into Northern Thailand, it’s time to head to Laos for your next phase of adventure! Kickstart your Laotian experience at Luang Prabang, a hidden gem that still remains relatively unexplored amongst many travellers. Your first stop should definitely be Ock Pop Tok Living Crafts Centre, located on the banks of the Mekong River. Here, you’ll be able to learn about the entire textile-making process and even watch weavers at work! You’ll definitely be fascinated by the process of dyeing, where natural products such as marigolds and anato seeds are used to make yellow and orange on the textiles respectively. Guess what? You can even sign up for half, full-day, or 2-3-day classes and workshops where you’ll learn about natural dyes, weaving, Hmong batik and more! It’s an eye-opening and enriching experience you’ll never get elsewhere for sure. Plus, Ock Pop Tok helps the local women weavers, by providing them with a sustainable livelihood through competitive wages and selling their handmade traditional textile designs and products. This non-profit and eco-friendly centre that stands by fair trade principles is definitely worth your support. Don’t forget to have lunch at the in-house cafe, Silk Road Cafe, with a splendid view of the Mekong river to boot! 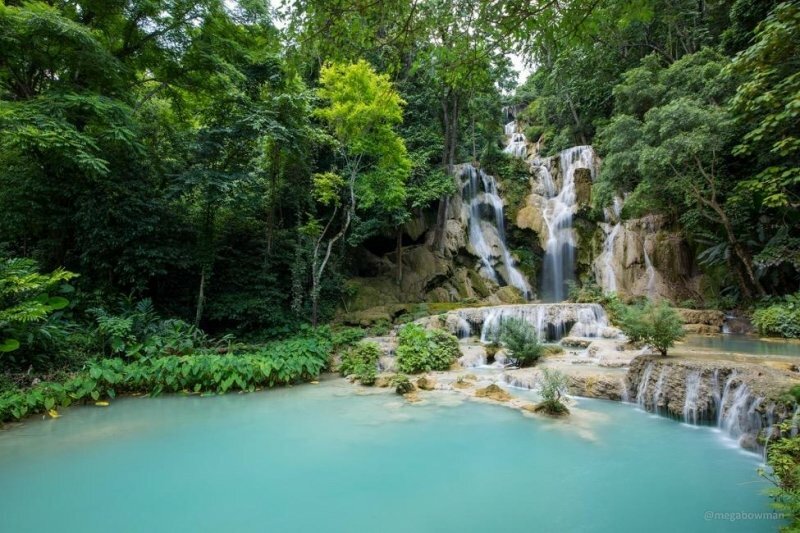 Next, the Kuang Si Falls, is literally the most iconic highlight of Luang Prabang. The series of falls and pools complemented by turquoise waters will simply take your breath away! Be prepared to take an endless amount of photos as you walk on the rocks and swim under the falls. A verdant oasis surrounded by tall trees, rays of sunlight filtered through the leaves, and the soothing sounds of rushing water, you’ll never want to leave this fairytale-like enclave at all, hidden away from the rest of the world. There’s also a bear sanctuary in Kuang Si, the Tah Kuang Si Bear Rescue Centre, which you’ll spot on your way to the waterfalls. 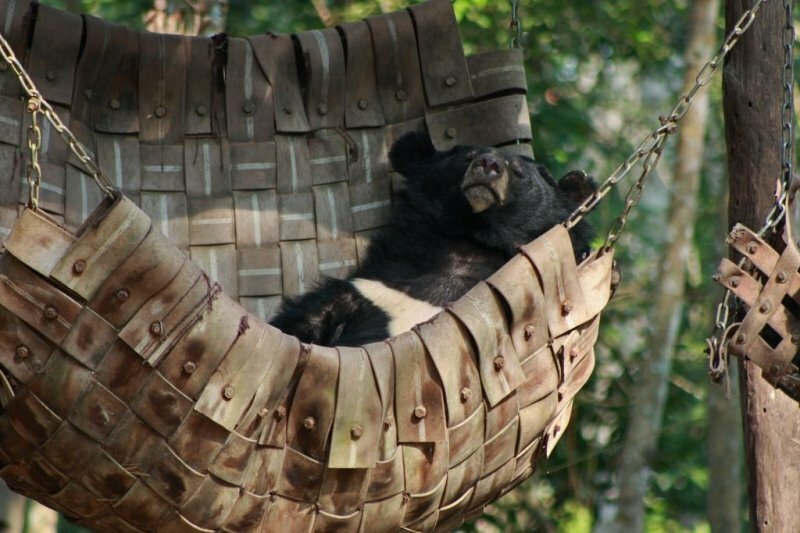 They house bears rescued from poachers and traffickers, who look positively happier roaming around freely and playing with each other, climbing up trees and lazing around on swings! They are absolutely adorable and furry, you’ll find yourself going ‘awww’ before you even know it. And what’s a Laotian vacation without a homestay experience? 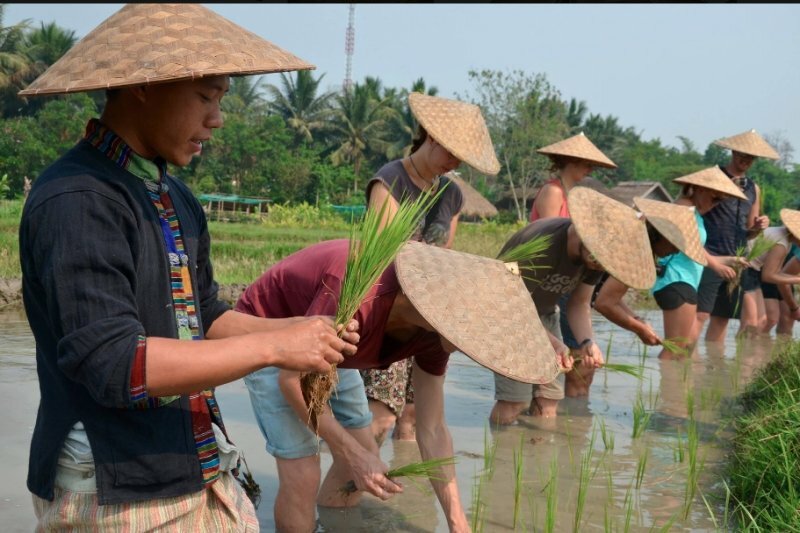 Here at The Living Land Farm Lao, you’ll learn about how rice is grown and have the chance to experience being a farmer for a day! Stay for a night at their converted rice barn and be generously rewarded with picturesque views of mountains and rice fields. Take multiple gulps of their home-brewed rice wine and go for a ride on their sturdy water buffaloes! Still have time to explore Luang Prabang in its full glory? Sign up for day tours and you’ll definitely be able to explore the city with ease and convenience. Plus, stand to enjoy S$5 off Klook’s Southeast Asia’s attractions & tours with a minimum spend of S$80, when you book using your HSBC Credit Card! After exploring Luang Prabang, take a bus or minivan down to Vang Vieng, another hotspot in Laos! There are plenty of fun and exciting activities you can do here, from tubing in a cave, to kayaking, hiking and more. 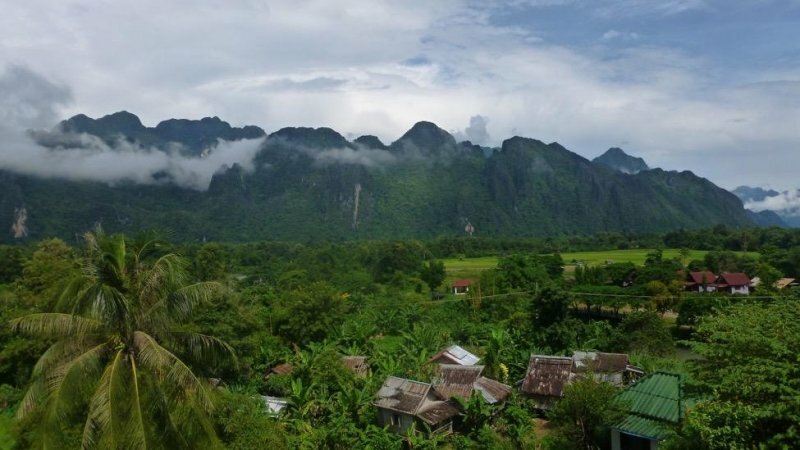 Wake up early so you can admire the gorgeous karst landscapes and the tranquility of the Nam Song River, away from the usual noise and crowds of tourists and party revellers. 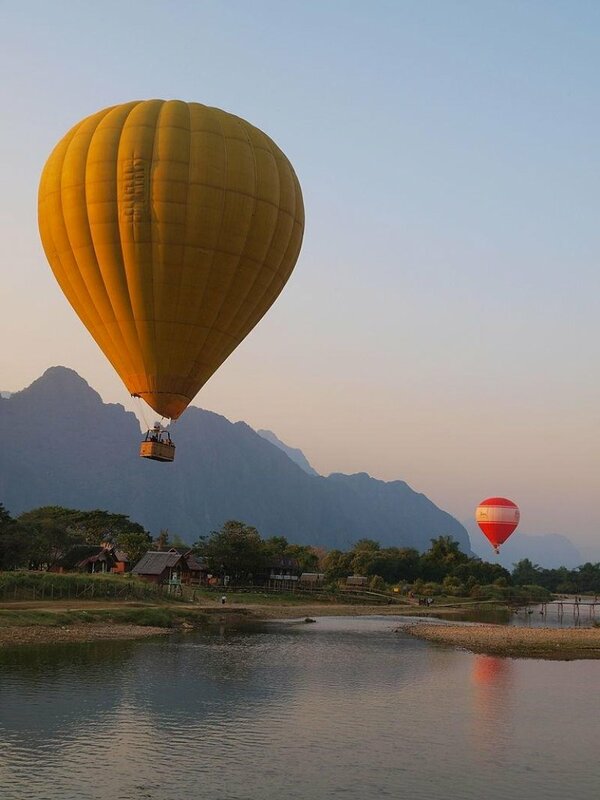 And here’s an activity you don’t normally associate with Vang Vieng – hot air ballooning! Getting to watch the sunrise above the iconic limestone karsts, from hundreds of feet up in the air, is undeniably an enrapturing experience. Soak in the panoramic views during your 40-minute ride up in the air. Plus, there’s no reason to resist this awesome activity because it’s one of the cheapest places around the world for hot air balloon rides. 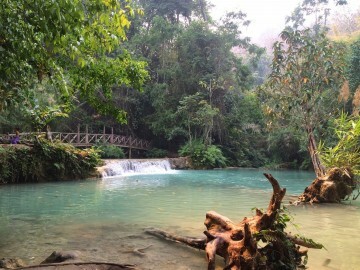 To conclude your Laotian adventure with a bang, a trip to Blue Lagoon is definitely warranted! Its reputation far precedes itself, but it’s easy to see why. 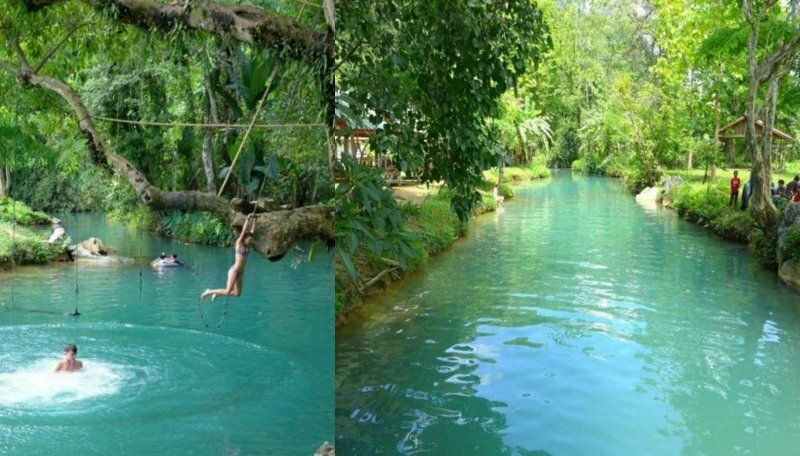 Providing a much-needed escape from the tropical heat, head here for a splashing good time as you jump off the trees into the aquamarine waters below! Spend your day relaxing, and you’ll feel invigorated and refreshed after playing in the waters – ready for the next segment of your adventure ahead! The last stop of this epic itinerary is none other than Myanmar! A charming country with an inexplicable rustic beauty and tons of glistening gilded stupas scattered throughout its cities – your travel experience here will definitely be one for the books. First up, Inle Lake! A trip to Myanmar would be incomplete without visiting this tranquil and iconic attraction. 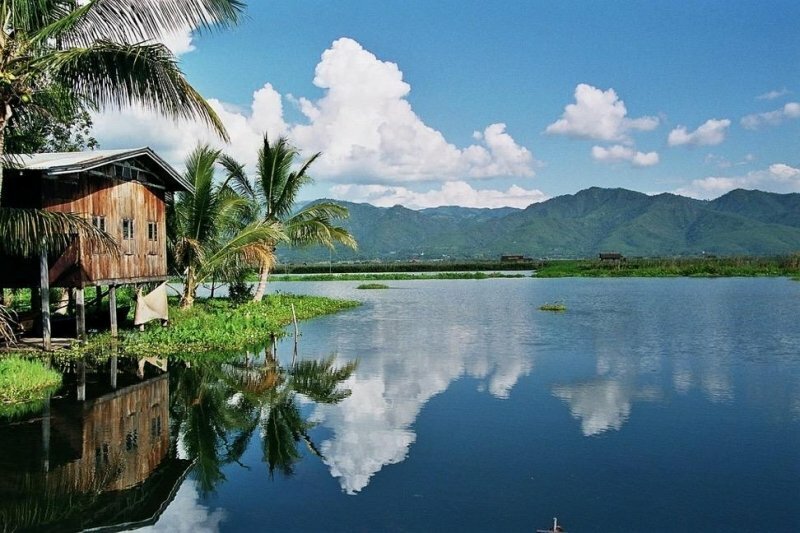 Fly into Myanmar and land at Heho Airport, 40 minutes away from Nyuang Shwe – the nearest town to Inle Lake. There’s plenty to explore, from visiting the floating gardens, to seeing the stilt houses, shopping at the local market, saying hello to the long-necked women of the Padaung Tribe and more! Hop on a boat tour to fully explore the area and spot the fishermen with a distinctively unique way of rowing. 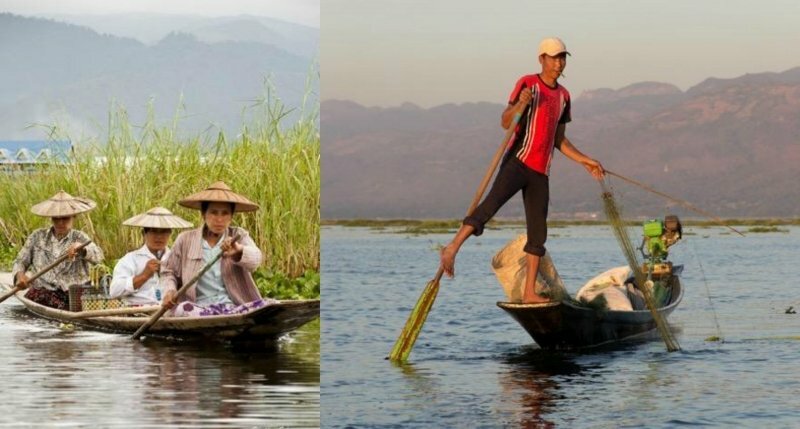 Most of all, you’ll HAVE to stay in a cottage overlooking the Inle Lake, it’s the best way to truly experience the surreal calmness and quiet stillness of the lake and its surroundings. The best part? Watch the sun rise and set over the lake right from your balcony! Witness the sun lighting the sky awash with hues of gold, orange and pink – the perfect way to start and end your day. The Shwe Indein Pagoda is another must-visit site located on the west bank of Inle Lake. Be awed by the 1,600 stupas and pagodas that fill the complex – in varying states of restoration. Some remain in the original crumbling state, while others have been repaired and even given a new lease of life with a layer of gold paint. A mystical and historical site of spiritual importance, it’s definitely worth a visit, no matter how remote it is. After a fruitful two days at Inle Lake, fly to Yangon for the second half of your Myanmar adventure! 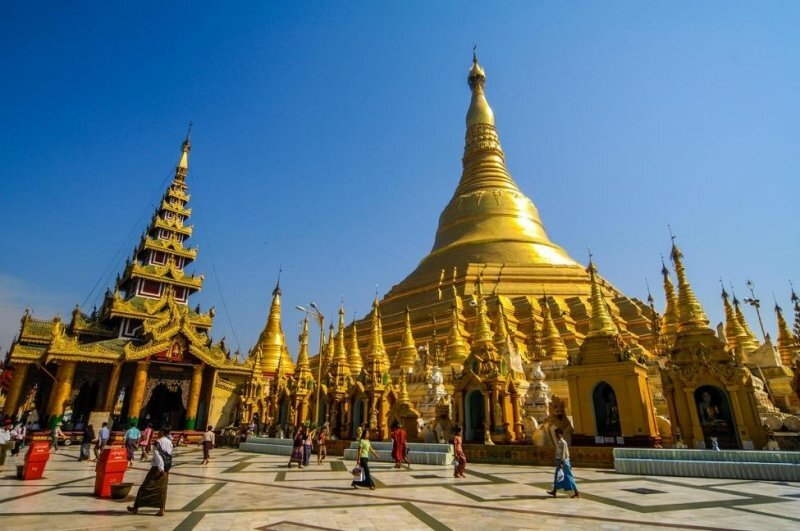 Kickoff your explorations at the Shwedagon Pagoda, which dates back to 2,500 years ago. As the most sacred and impressive Buddhist site in Myanmar, the entire site is filled with temples, stupas, and statues, coated in glistening gold that shimmers in the broad daylight. A spectacular sight reflecting the intricate architecture and religious significance of the Buddhist belief, bear witness to the bustling scene of monks and devotees worshipping, offering flowers and more. Once you’ve finished exploring Shwedagon Pagoda, head over to Kandawgyi Lake for a languid stroll amidst the tranquil surroundings. There are plenty of lakeside cafes so you can always stop whenever you like for a refreshing cup of iced coffee! The serene sight of lush greenery reflected upon the surface of the reservoir waters are incredibly relaxing and soothing to the eyes. From cultural sites to architectural marvels, Yangon has plenty to offer. Make sure that you visit them all by booking a day tour with Klook! From private tours to street food tours, you’d be able to get S$5 OFF with a minimum spend of S$80 when you book Southeast Asian attractions and tours with Klook using your HSBC Credit Card! 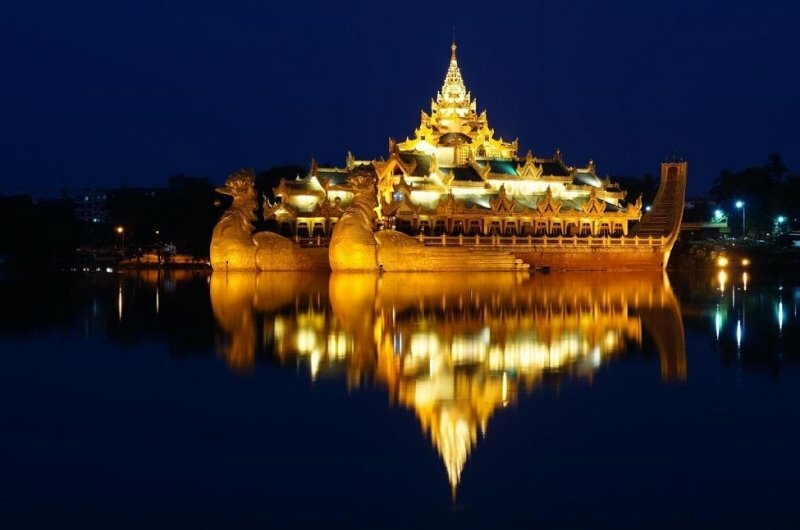 As night falls, you’ll be treated to an even more glorious sight of the Karaweik Palace floating majestically on the Kandawgyi Lake. Its reflection is a splendid and alluring picture you just wouldn’t be able to tear your eyes away from. At the palace, you’ll get to treat yourself to a sumptuous buffet while watching traditional performances, such as puppet shows, elephant dance, and Burmese dancing. You can even check out their exhibition of Burmese arts and crafts, as well as traditional costumes! Last but not least, the best way to explore Yangon is by hopping onboard the Yangon Circular Train. Get ready for an unforgettable ride, as the train travels around the city in a loop comprising of 39 stops! 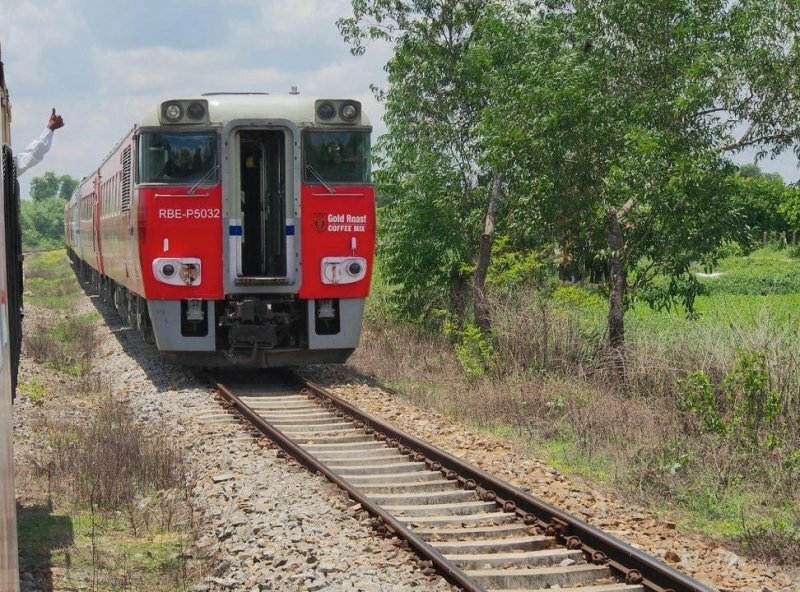 This local rail network is the cheapest mode of transportation you can get in Yangon, where you’ll meet a frenzy of locals getting onboard and disembarking at every station, from fruit-sellers to monks draped in their iconic red or orange robes. As you stare out of the window during your train ride, be rewarded with varying landscapes of rural villages, sprawling paddy fields, lush greenery and the occasional concrete building along the way. It offers you an insightful glimpse into the daily lives of the local Burmese, and all the quaint, rustic beauty that Myanmar has to offer. Who knows – by the time you’re due to leave, you may realise that you’ve left a part of your heart in this alluring country. HOLD UP! Before you leave for your epic 2-week vacation in Southeast Asia, don’t forget to buy your travel insurance! Ensure that you and your loved ones are covered for your travel – and you even get to enjoy a whopping 25% OFF if you purchase it with your HSBC Credit Card! And that marks the end of this EPIC 2 weeks traversing across Vietnam, Thailand, Laos, and Myanmar! Tempted to try it out yourself? Get down to planning right now and start booking your flights, accommodations and all the other travel essentials with your HSBC Credit Card today! Brought to you in partnership with HSBC Credit Cards.